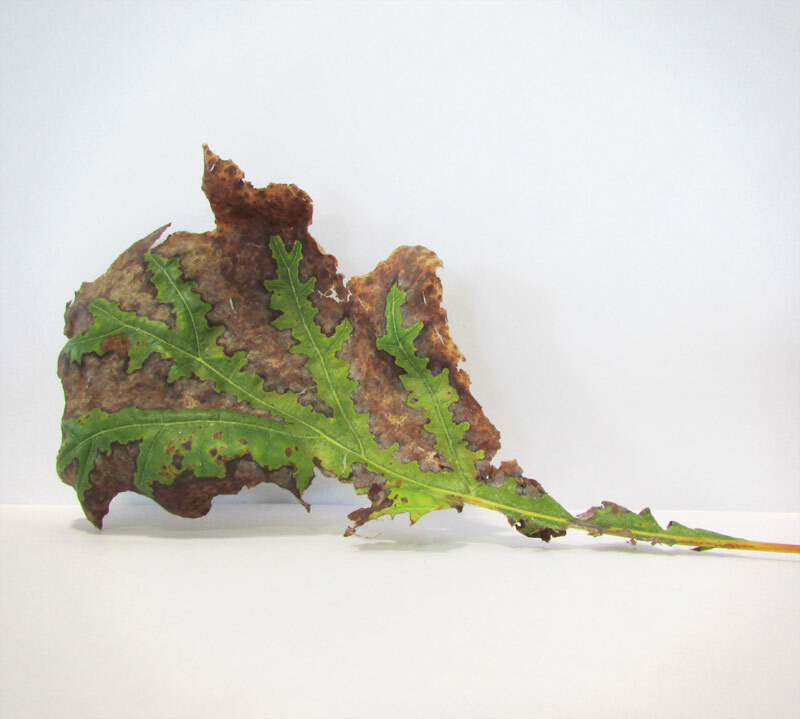 A customer brought in a sample of some of his oak tree leaves which have been discoloring annually along the edges. He went on to explain that the plant’s location was once backfilled with lime stone and other various rocks to help give a solid foundation before soil was laid (in this case, about 20″ of soil was applied) so a structure could be built. There is also about 10 feet between the tree and a waterway. Oaks have a deep root system. As his tree continues to mature, the roots will continue to grow as well – the problem is that now his tree has an obstacle in the way of healthy root development and is now developing symptoms of scorch. For his situation, a maple would probably serve this location better. Annual bluegrass can be unsightly in home lawns, especially when it produces seed heads. Germination typically occurs in early fall when the soil temperature dips below the 70 degree mark. If annual bluegrass is problematic in your lawn, the best treatment is a late summer application of pre-emergence (though this herbicide will halt turf seed from germinating too). This will stop the seed heads from germinating before winter sets in. The above images show a close up of the seed head and a germinated annual bluegrass plant. If you have annual bluegrass in your lawn and you want to schedule a pre-emergent for summer, give us a call as so we may note your account: 419-536-4344. Seal cracks around windows, doors, chimneys, siding, etc. Stink bugs may be targeted with a [dish] soap/water mixture. This spray must come in direct contact (sprayed on the pest) with the stink bug for it to be effective in terminating the pest. This is a great video of someone trying different mix rates of soap and water specifically for stink bug control: https://www.youtube.com/watch?v=m6m9xzhphLs Bifenthrin has also shown promise in controlling these pest. May is right around the corner and also marks Lyme Disease Awareness Month. In an article posted on Yahoo Health ( https://www.yahoo.com/health/ticks-are-early-abundant-and-urban-this-year-117256478987.html?soc_src=unv-sh&soc_trk=tw ) has noted that tick activity this year is expected to start earlier than usually and possibly be more abundant than usual, especially in areas that were blanketed with snow during the winter. Ticks will usually wait for a host by resting on tall vegetation, when the host rubs up against the plant the tick will then ‘grab’ onto him/her and begin to search for an appropriate feeding site. Ticks can locate to a new area by hitching a ride on a host, be it a deer, bird of other animal. 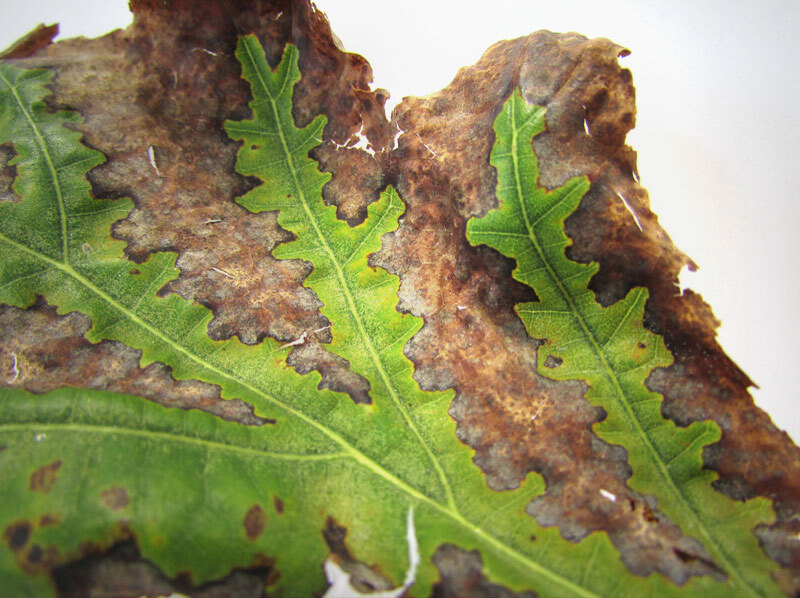 Salt can cause considerable damage to plants as it breaks down in the soil and starts replacing available nutrients with compounds that are toxic to the plant, some plants are more susceptible to its effects than other. If your plants are along a roadway that may get slush spray from salted roads you can help protect them by building a barrier with plastic along the road way. Water the landscaped areas and trees close to walkways, roads or drives deeply before winter sets in. 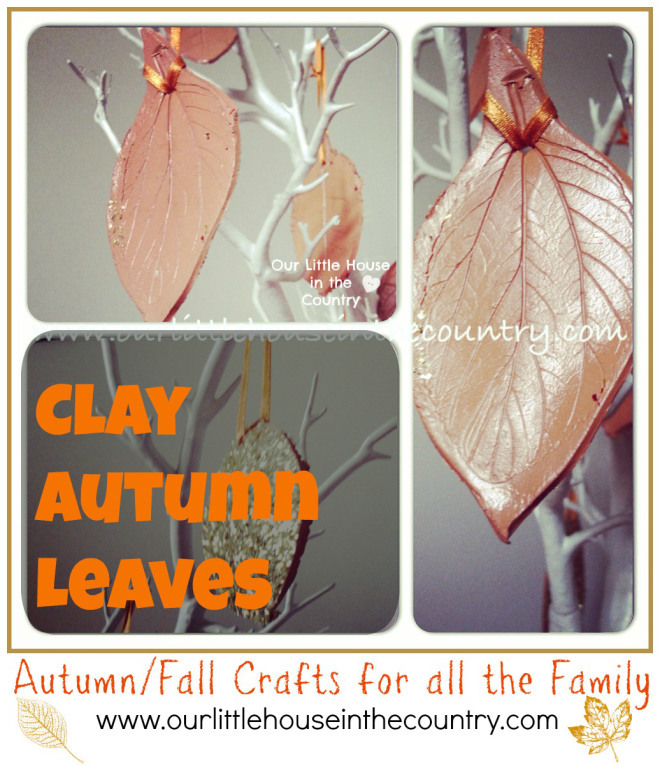 You can also add gypsum to promote leaching in late fall or spring (when the snow thaws). Use salt that does not contain sodium chloride for areas around sensitive plants. Wrapping the trunk of a tree with tree wrap or a light colored wrap will help reflect the suns rays to help prevent activated growth during the winter months. Heavy cold winds can cause evergreen plants to lose moisture through their needles and dehydrate them. The needles will become brown (though that is not an indication that the whole branch is dead) and unsightly. Help protect your conifers by watering deeply before winter sets in and setting up a burlap barrier on the unprotected side of the tree. Mulch newer trees to help the soil cool down slower and retain moisture. 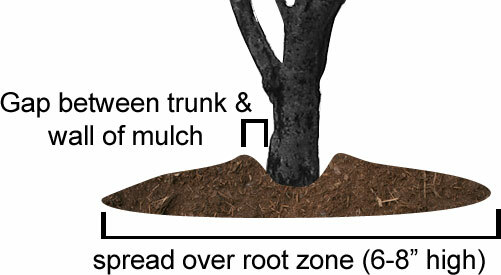 Never pile mulch directly against the trunk of the tree – it should have a ‘volcano’ appearance (as if the trunk of the tree is the lava shooting out).